NEW: Delta statement: "Using laptops ... will result in termination"
(CNN) -- The pilots of the commercial jetliner that last week overshot its destination by about 150 miles have said they were using their laptops and lost track of time and location, federal safety officials said Monday. The Airbus A320 was flying at 37,000 feet over the Denver, Colorado, area at 5:56 p.m. Wednesday when it last made radio contact, the safety board said. Northwest Flight 188 had departed San Diego en route to Minneapolis-St. Paul International Airport carrying 144 passengers, two pilots and three flight attendants. 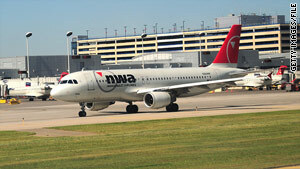 Northwest recently merged with Delta Air Lines. "Using laptops or engaging in activity unrelated to the pilots' command of the aircraft during flight is strictly against the airline's flight deck policies and violations of that policy will result in termination," Delta said Monday in a statement. Pilot Timothy B. Cheney, 53, was hired in 1985 and has more than 20,000 hours flight time; First Officer Richard I. Cole, 54, was hired in 1997 and has about 11,000 hours of flight time, the report said. Neither pilot reported having had an accident, incident or violation, neither had any ongoing medical conditions and neither said he was tired, it said. They each had a 19-hour layover in San Diego; neither said he had slept or argued during the flight, but both said "there was a distraction" in the cockpit, according to the report. The pilots said there was "a concentrated period of discussion where they did not monitor the airplane or calls" from air traffic control, though both said they heard conversation on the radio, the report said. Neither pilot said he noticed messages sent by company dispatchers, it added. It said the men were talking about the new monthly crew flight scheduling system put into place in the wake of Northwest's merger with Delta Air Lines. "Each pilot accessed and used his personal laptop computer while they discussed the airline crew flight scheduling procedure," the report said. "The first officer, who was more familiar with the procedure, was providing instruction to the captain. "Neither pilot said he was aware of where the plane was until a flight attendant called the cockpit about five minutes before the plane was to have landed and asked their estimated time of arrival, the report said. "The captain said, at that point, he looked at his primary flight display for an ETA and realized that they had passed" the airport, it added. After 78 minutes of radio silence, the pilots re-established radio contact with air traffic controllers, it said. After landing at Minneapolis-St. Paul, both voluntarily underwent alcohol breath tests, which proved negative, the report said. The safety board said its investigators interviewed the pilots separately Sunday in Minnesota for more than five hours combined. The investigation will include scrutiny of the flight and voice data recorders, it said. An airline spokesman said Monday the company has sent the passengers on the plane $500 travel vouchers to compensate them for their inconvenience, and that the pilots have been suspended until the conclusion of the investigations. The NTSB on Monday interviewed the three flight attendants who were on the plane, a spokesman for the Association of Flight Attendants said. The lead flight attendant told officers she was unaware there had been an incident aboard, according to the report. Police who met the wayward jet said the pilots were "cooperative, apologetic and appreciative." The NTSB is hoping the plane's cockpit voice recorder either will confirm the pilot's account or provide evidence of another possible explanation, including whether the captain and first officer fell asleep. The voice recorder is capable of recording only 30 minutes of audio, federal accident investigators said. The plane was in the air for another 45 minutes after radio contact was restored, meaning that if the recorder was working properly, anything the pilots would have said during the time they weren't answering radio calls would have been recorded over. But a former accident investigator said the voice recorder may still provide valuable information, because the pilots could have discussed the earlier events on the way back to Minneapolis after overshooting the airport. The flight data recorder also could prove valuable because it would have recorded actions taken by the pilots during the 78 minutes they did not respond to repeated calls from air traffic controllers, the ex-investigator said. Meanwhile, the North American Aerospace Defense Command, which scrambled fighter jets for the wayward plane but did not launch them, said it was reviewing procedures for launching the fighters to track potentially hijacked or suspicious aircraft. At issue is the Federal Aviation Administration's apparent delay in notifying NORAD the Northwest jet was not in contact with controllers, according to a senior U.S. official directly familiar with the timeline of the incident. The official, who declined to be identified because the military and the FAA are reviewing the incident, said the FAA's request for military involvement came after the plane passed the Minneapolis-St. Paul airport. NORAD scrambled fighter jets at two locations. But as they approached the runway for takeoff, the FAA reported being back in contact with the Northwest flight, and the fighters stayed on the ground. "My real question is why we did not know of the 'radio out' situation from the FAA sooner," the official said. "The FAA is also looking into that." Since the September 11, 2001, attacks, NORAD has regularly launched fighter jets to track aircraft in unusual situations such as when they deviate from flight plans, lose radio contact or enter restricted airspace. According to a second U.S. official, NORAD is in constant contact with the FAA so it can respond when situations arise. CNN's Mike M. Ahlers and Barbara Starr contributed to this report.